The future of the world’s largest operational fusion research facility has been secured with a new contract signed between the UK and the European Commission. The contract extension will secure at least €100m in additional inward investment from the EU over the next two years. The news brings reassurance for the more than 500 staff at site in Culham, near Oxford. Staff at the Joint European Torus (JET) facility in Oxfordshire undertake research in the latest technologies aimed at providing clean, safe, inexhaustible energy. The new contract guarantees its operations until the end of 2020 regardless of the EU Exit situation, and secures at least €100m in additional inward investment from the EU over the next two years. Having made my first speech at Culham, I know how hardworking and dedicated UK Atomic Energy Authority staff are, which is why I’m pleased to announce today’s agreement, which is great news for the future of scientific research in Oxfordshire, the UK and Europe. Extending this contract means cutting-edge and world-leading fusion research can continue in this country, which I know will be a welcome reassurance to the hundreds of workers at Culham. Science has no borders and as we leave the EU, this kind of international collaboration remains at the heart of our modern Industrial Strategy to maintain the UK’s position as a world leader in research and innovation. JET is operated by the UK Atomic Energy Authority at Culham Science Centre, near Oxford. Scientists from 28 European countries use it to conduct research into the potential for carbon-free fusion energy in the future, through work coordinated by the EUROfusion consortium which manages and funds European fusion research activities on behalf of Euratom. This new contract provides reassurance for over 500 staff at JET, including many from outside the UK. It also means JET can conduct a series of vital fusion tests planned for 2020. These tests will serve as a ‘dress rehearsal’ for the new international experimental fusion reactor, ITER, currently being built in southern France. The extension to the contract is excellent news for both EU and UK science. JET has been a shining example of scientific co-operation between EU members, and this news means that these mutually beneficial collaborations will continue, allowing us to do essential experiments on the path to delivering fusion power. A heavy weight has been lifted off our shoulders. This is extraordinarily good news for EUROfusion and the European fusion community as a whole. We can now continue to work on the realisation of fusion energy together with the indispensable experience of our British partner. Fusion research aims to copy the process which powers the Sun for a new large-scale source of clean energy here on Earth. When light atomic nuclei fuse together to form heavier ones, a large amount of energy is released. To do this, fuel is heated to extreme temperatures, hotter than the centre of the Sun, forming a plasma in which fusion reactions take place. A commercial power station will use the energy produced by fusion reactions to generate electricity. Nuclear fusion has huge potential as a long-term energy source that is environmentally responsible (with no carbon emissions) and inherently safe, with abundant and widespread fuel resources (the raw materials are found in seawater and the Earth’s crust). 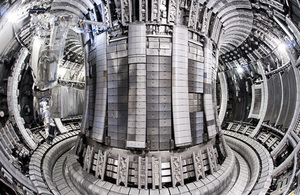 Researchers at Culham are developing a type of fusion reactor known as a ‘tokamak’ – a magnetic chamber in which plasma is heated and controlled. The research is focused on preparing for the international tokamak experiment ITER, now being built in southern France. ITER – due to start up in 2025 – is designed to show that fusion can work on the scale of a power plant, and if successful should lead to electricity from fusion being on the grid by around 2050. The Joint European Torus, based at Culham Science Centre, UK, is the central research facility of the European fusion programme. It is the largest and most powerful fusion experiment in the world. JET is collectively used under EUROfusion management by more than 40 European laboratories. JET was the first fusion device to perform controlled nuclear fusion (in 1991), holds the world record for fusion power and is the only tokamak that can test the fusion fuel mix (deuterium and tritium – two isotopes of hydrogen) expected to be used in commercial reactors. Today, its primary task is to prepare for the construction and operation of ITER, acting as a test bed for ITER technologies and plasma operating scenarios. The UK Atomic Energy Authority carries out fusion energy research on behalf of the UK Government at Culham Science Centre near Abingdon. It is also developing Culham as a location of hi-tech research and business, with around 40 tenant companies now on site. EUROfusion’s mission is to pave the way for fusion power reactors. Currently, 30 research organisations and universities from 26 European Union member states plus Switzerland and Ukraine are part of the consortium. In addition, well over 150 universities contribute to the programme. The Consortium has received funding from the Euratom research and training programme 2014-2018 and 2019-2020 under grant agreement No 633053.